Every year I keep track of all the films I see for the first time, new or old. Here they are, my favorites are starred*. Still from 'American Honey', my favorite film released in 2016. Our second review is out and it's amazing! "Last month, we posted the teaser and poster art for the short film The Stylist by Jill "Sixx" Gevargizian. 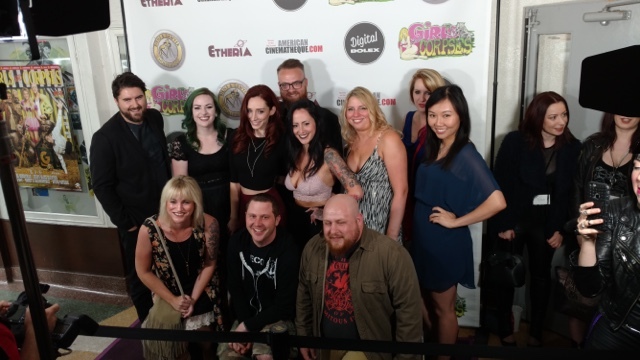 I recently saw the film at its world premiere during Etheria Film Night at the Aero Theatre in Santa Monica. As one of only nine short films screened that night --- tough odds by any means --- The Stylist stood out because of its poignancy, practical special effects, writing, acting, direction, editing, and beautiful cinematography (lensed by Robert Patrick Stern). The echoing, melodic score from Nicholas Elert elevates the film even more. And I'm not alone in my adoration for this film --- it won both the Jury Award and the Audience Choice Award, which sent Gevargizian into a mild state of shock. The awards are well deserved --- the film is THAT good. Produced by The Line Film Co. and written by Eric Haven (based on a concept from Gevargizian), The Stylist stars Najarra Townsend as Claire, a hairdresser waiting for her last client. Mandy (Jennifer Plas) who's a bit late, isn't particularly demanding, but does request to "look perfect" for her big work event --- a probable promotion is at stake. So while Mandy imbibes her complimentary salon glass of red wine (love those), Claire gets to work and makes magic of Mandy's golden tresses --- and then Mandy promptly passes out. That's when Claire really gets down to business. The Stylist is another of those short films where to say to much would be to spoil the film for future viewers, and that's something I'd rather not do. So let's just say that there's an absolutely cringe-inducing FX gag (by Colleen May assisted by Philip Spruell) that's done very wel. The added sound design may make you pull yourself up into a ball and grab a certain part of your body --- the one that corresponds with what's being desiccated onscreen. I'm still shuddering thinking about it. What ends up happening is more or less an updated version of Maniac, if the antihero of that film (and its remake) was a beautiful stylist with some serious issues. And for me, that was the best part --- Townsend plays the lead with such subtlety, humanity, and anguish --- that you're rooting for her even as you've seen what she's done and what she's capable of doing. Then there's the added touch of Claire's pup Pepper, who plays herself (she's Gevargizian's pet in real life). The tiny dog watches Claire, seemingly wondering what mess her owner has gotten into, and it's ridiculously adorable. Gevargizian has accomplished what few horror directors have --- a film with terror, art, and heart. The Stylist does a wonderful job of making you care for its characters, rather than just cheer on the body count. You'll be hearing more from Gevargizian in the future --- she's a serious talent who's made an enormous jump from her previous shorts, such as Grammy, Police Brutality, and Call Girl. I can't wait to see what she does next, and if you're a development executive, you'll be paying attention, too. You can learn more about Gevargizian and at The Stylist on her website and at the film's Facebook page. See it at a festival near you!" Our very first review from Starburst Magazine! 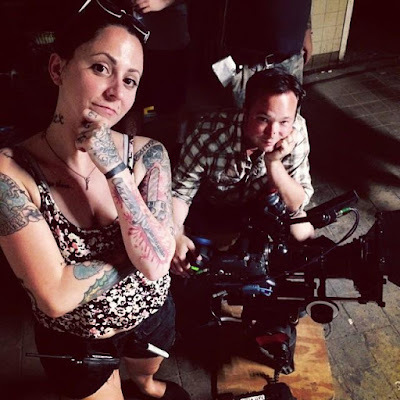 "Following on from the hit short Call Girl, not to mention working on several big name genre features, Jill ‘Sixx’ Gevargizian returns with another work of art that shows her sublime touch with the genre and validates the praise we’ve already heaped on the rising star of modern horror. The premise of The Stylist is a very simple one: Claire (Townsend) is working late in her salon, waiting for her last client of the day. When Mandy (Plas) arrives, she’s full of excitement for her swanky business party and wants to look her best; who knows, she may even make a good enough impression to get that promotion she’s longed for. As usual with short films, the less one knows about the plot before going in, the better. This is certainly true ofThe Stylist, as we’re taken on a shocking ride - visually and emotionally - during the fourteen minute running time. With a background in hair styling herself, writer/director Jill Gevargizian shoots the otherwise mundane routine of washing and drying hair as though it’s a Cordon-bleu cookery show (or perhaps Hannibal’s cuisine sequences), with Claire caressing Mandy’s blonde locks with a tender longing. Which, of course, makes what comes next all the more shocking. Najarra Townsend, who was so sickeningly compulsive in Contracted, is once again superb as Claire. She’s a multi-layered character who goes far beyond cinematic psycho; it’s certainly difficult to elaborate on that without spoiling the intricacies of the story, but rest assured, it’s far from clichéd or predictable. Special mention must be made for cinematographer Robert Patrick Stern; the film looks stunning, and there’s not a wasted shot thanks to John Pata’s editing and Eric Haven’s screenplay (from Jill’s original story). The score (by Nicholas Elert) is moody, mournful, and unobtrusively atmospheric. The Stylist has already won awards at its sole festival screening, and we wouldn’t be surprised if more followed. 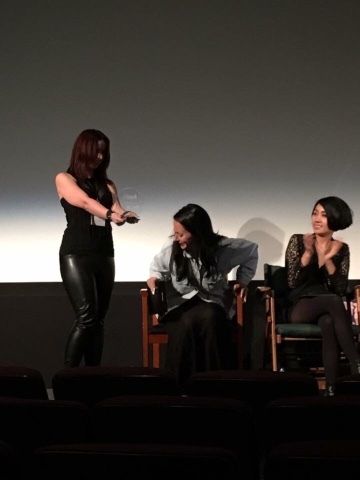 It’s encouraging to see the leap in confidence of the director from Call Girl and the micro-shorts likeGrammy and Police Brutality; she patiently tells the story without feeling the need to rush into crowd-pleasing gore sequences and the like. They are there, though, and the wait certainly pays off. 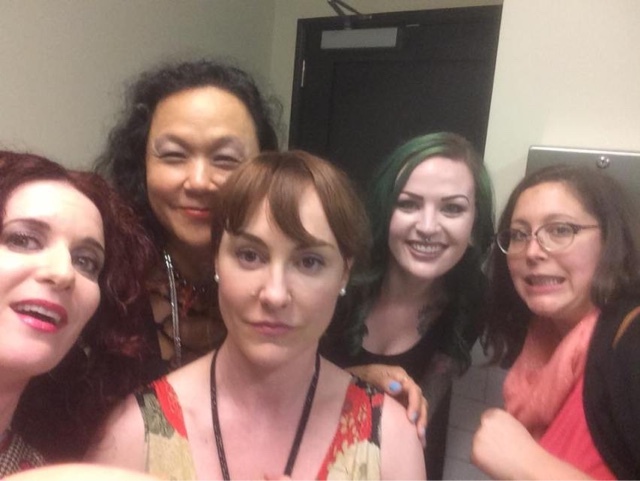 It’s not the bloodletting that is the kick for The Stylist, though. The climax is much more affecting than a simple shock. Keep an eye open for this one; you won’t want to miss it." 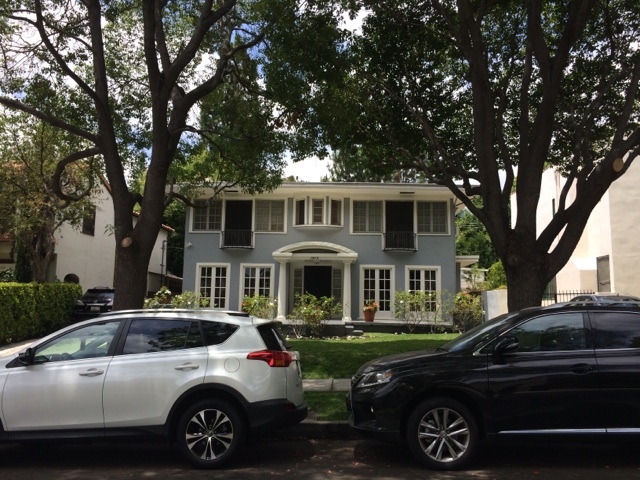 Click here to check out the full review. 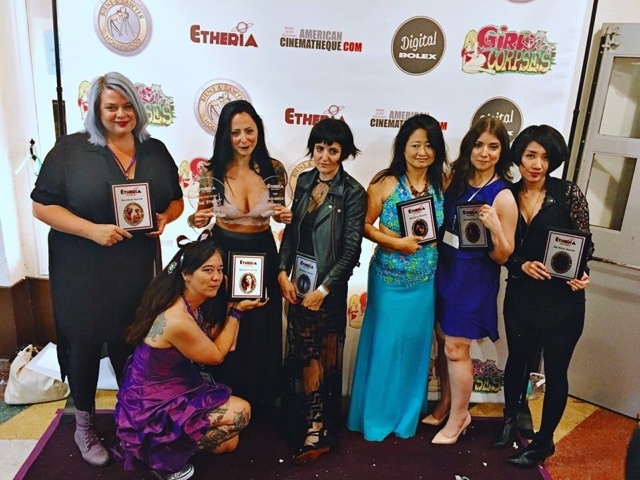 I am still on an incredible high from our world premiere two weekends ago in Los Angeles at Etheria Film Night - where we won the Jury Award and Audience Choice! 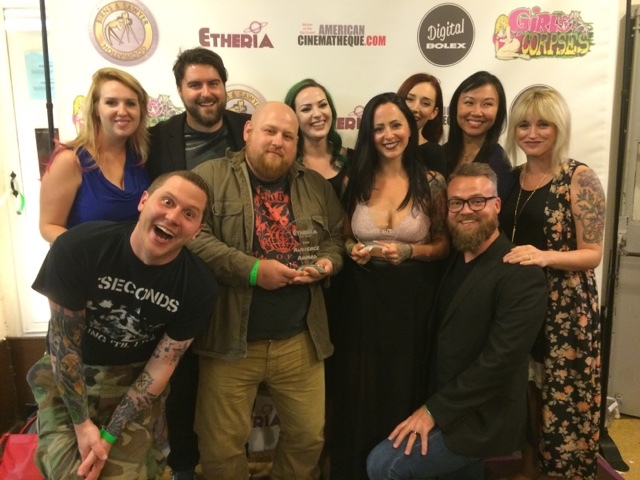 Etheria is a very competitive showcase for female directed genre films. Only 9 short films were selected out of over 1,000 submissions. Those 9 films were judged by a jury of major producers, directors and others in the biz - and our film was their favorite! I still can't believe it. 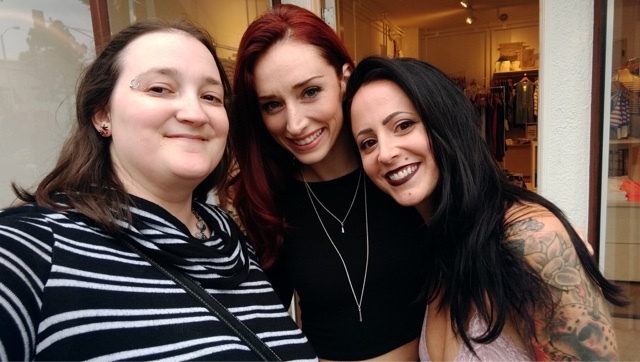 It was such a special weekend. I'm used to traveling to most festivals alone. But this time there was 11 of us who worked on the film there together. It was a once in a lifetime experience. I get weepy thinking about it. Thank you so much Eric Havens (screenwriter), John Pata (editor), Najarra Townsend (actress), Robert Stern (DP & producer), Sarah Sharp (production design & producer), Nancy Hoang (script supervisor), Courtney Jones (makeup), Angela Dupuie (actress & hairstylist), David Kox (grip), Jill Towerman (associate producer) for coming. I'll never forget it. Etheria treated us like royalty. Friday morning they held a photo shoot for the directors. How awesome are these photos by Andrea Macias?! 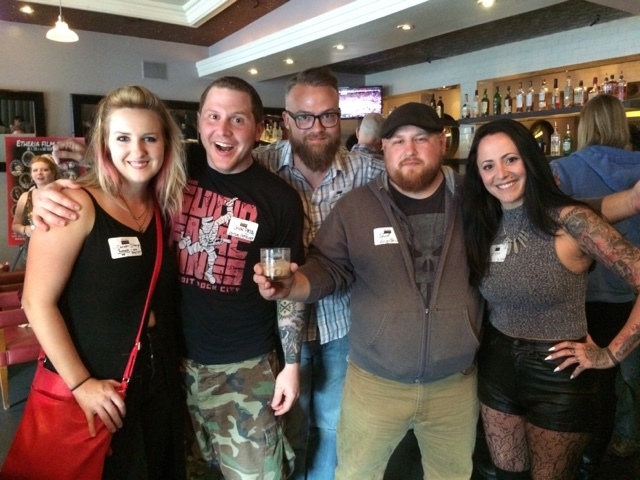 That evening was the kickoff party at Magnolia. 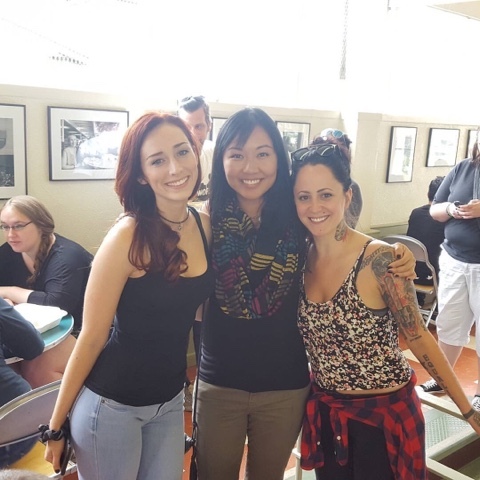 I met Jackie Kong, the director of Blood Diner, and she raved about The Stylist. She wants to work with us! 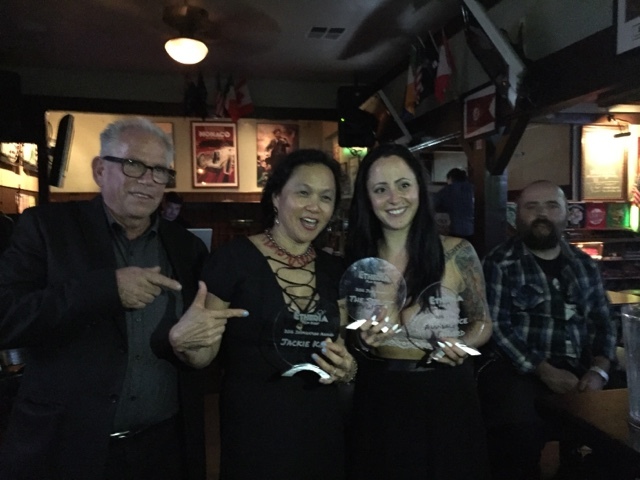 Etheria honored Jackie this year with the Inspiration Award. Saturday was the BIG DAY! I hired an SUV to chauffeur a chunk of us to the premiere. We stopped by the beach for photos. 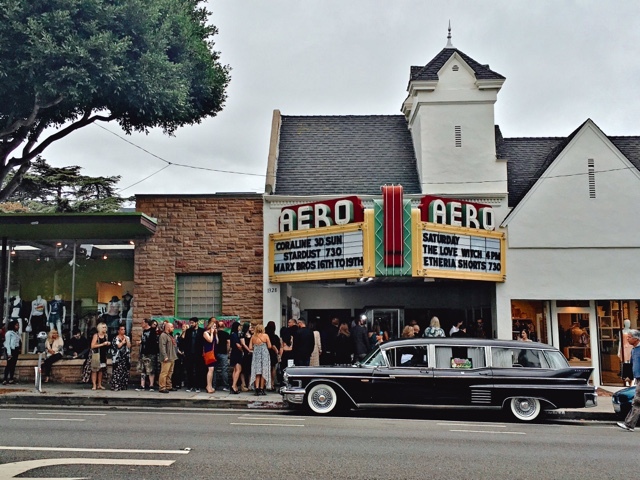 The main event was held at the Aero Theater in Santa Monica. It was an amazing night. My wildest dreams came true. 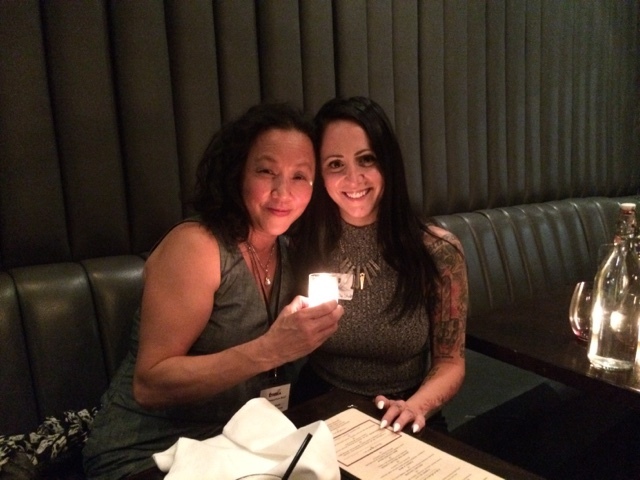 Jen and Sylvia Soska, directors who I consider mentors and great friends, came out to support us. And turns out- they had a secret plan to interrupt the award ceremony and demand to hand us our award. Which made the whole thing even MORE special. SO many people we love came out to support. The after party was a blast. 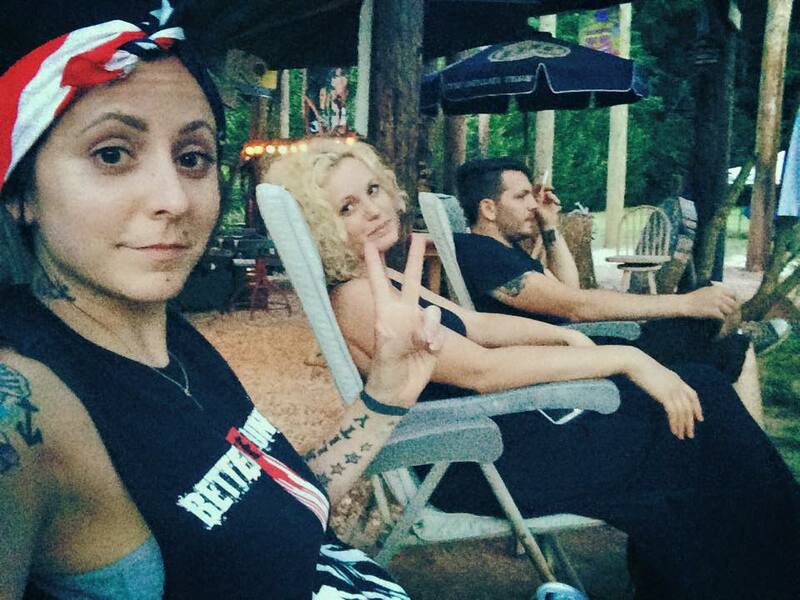 We danced the night away with Jackie and her family. 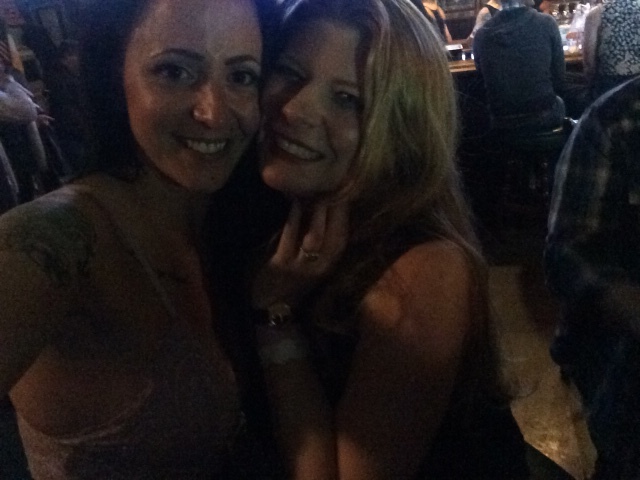 I finally got to meet and party with the amazing Izzy Lee- who I love! 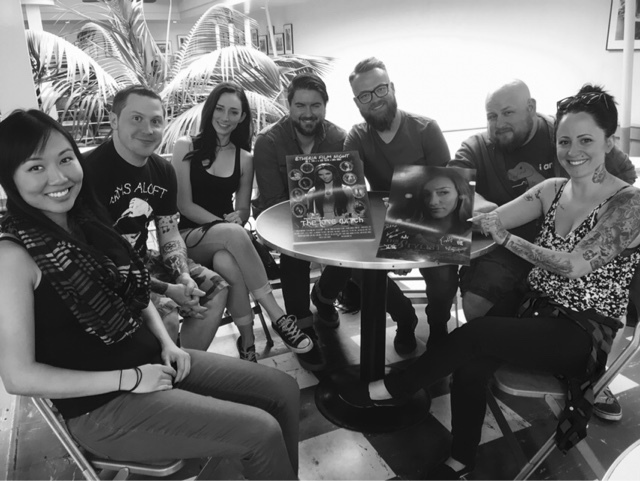 Sunday morning the Etheria gang met up for brunch. 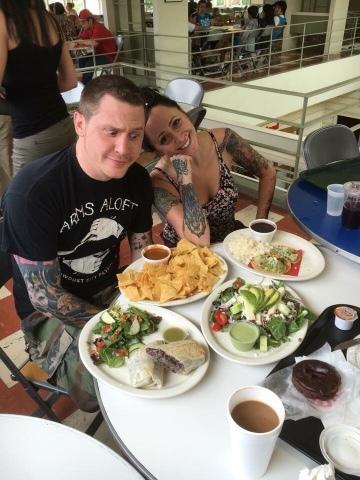 John went a little overboard on the food. 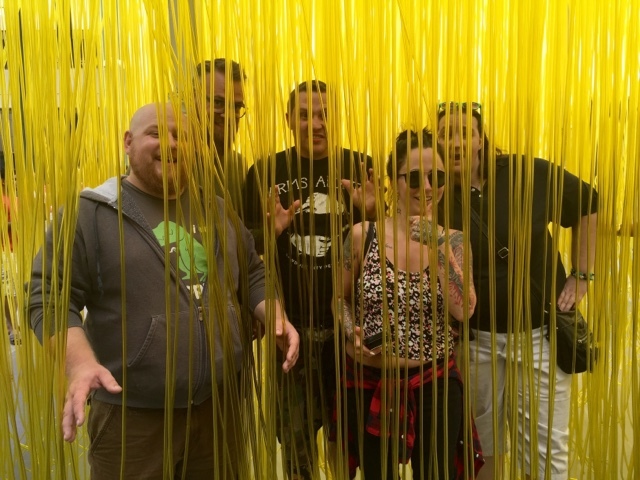 The Stylist crew spent the rest of the day together. 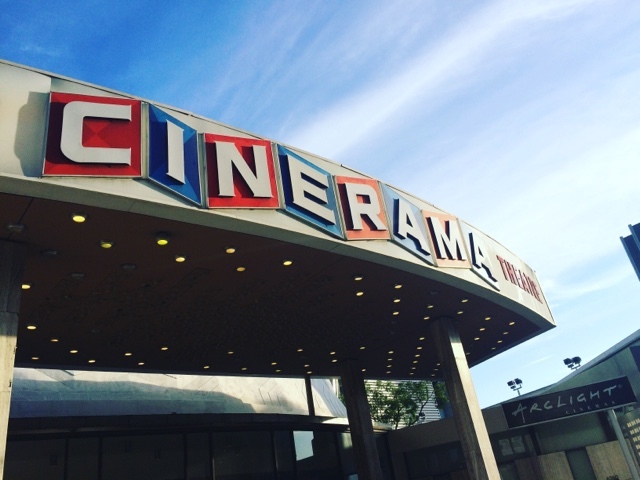 We went to the LaBrea Tar Pits, LACMA, and saw The Conjuring 2 in the dome theater at Cinerama. That night Eric, John and I went exploring. 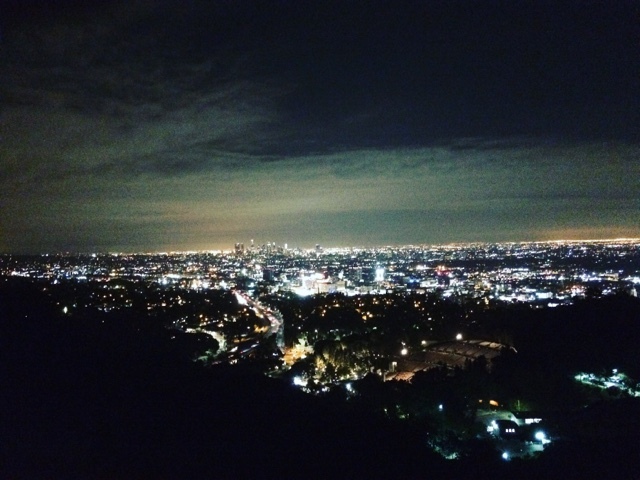 We drove some of Muhullond Drive and discovered the lookout above the Hollywood Bowl. 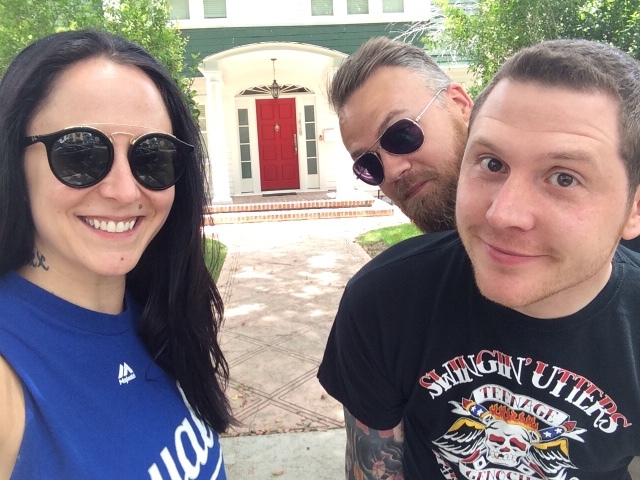 On our final day in Los Angeles we did some film-related sightseeing. 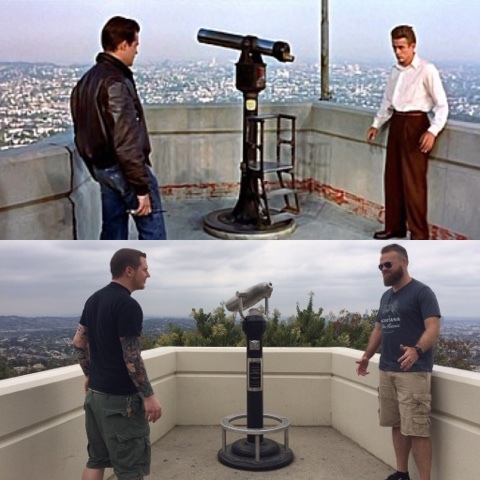 Starting with a reenactment of the shot from Rebel Without a Cause at the Griffith Observatory. 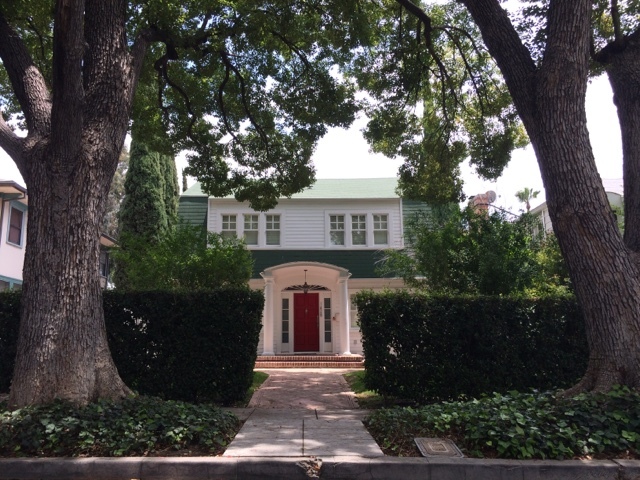 Next, we stopped by Elm Street to visit Nancy and Glen. I haven't had that much fun in a long time. I'll cherish these memories forever. 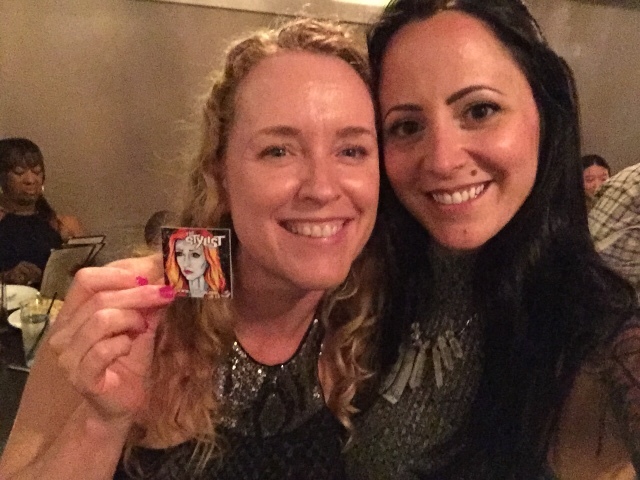 Some could see us as colleagues, and we are, but it's so much more than that to me. These people are my family. We believe in each other. We support each others dreams. That camaraderie is something I love and value very highly. And is probably my favorite thing about filmmaking. I can't wait to get back to work with this team again. It's been an honor. This Monday, June 6th is the 4 year anniversary of Slaughter Movie House - a monthly screening series for independent genre films I founded here in Kansas City, Missouri on June 4, 2012 with a screening of James Bickert's DEAR GOD, NO! 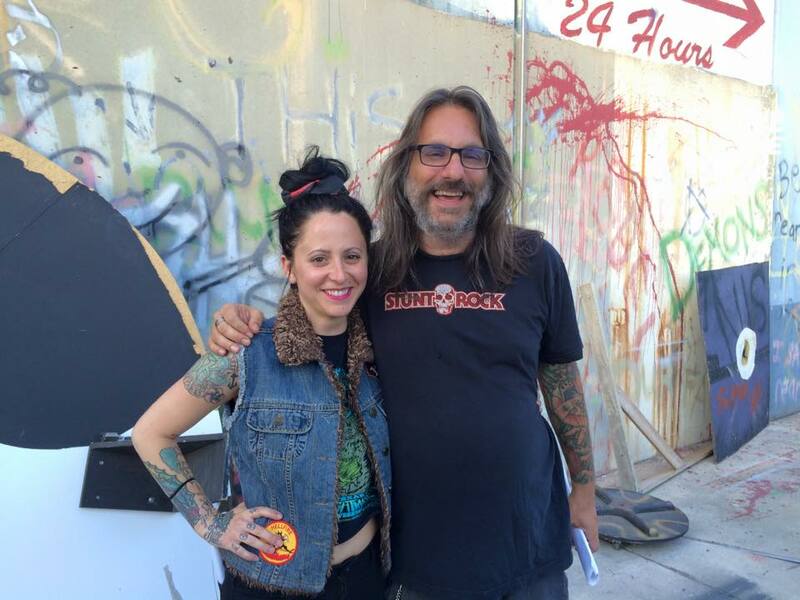 Three year later I had the honor of being his assistant director on the sequel, FRANKENSTEIN CREATED BIKERS. "Scary" Gary Cooper: Our true host of horrors and promoter. 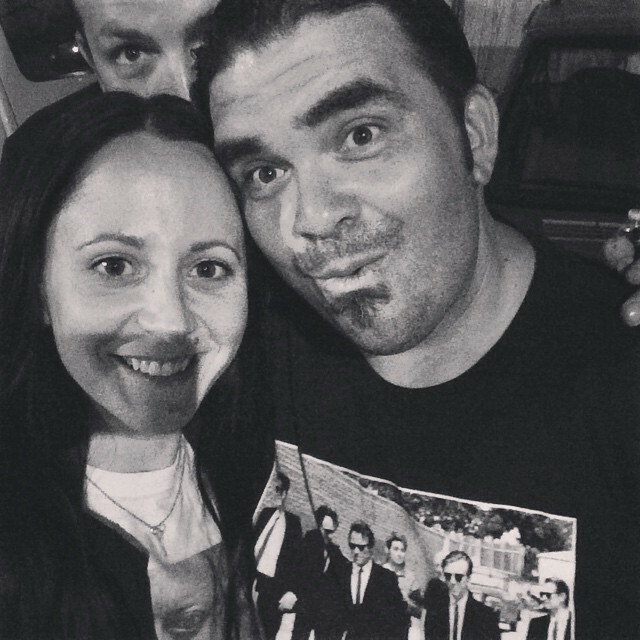 Gary has been my partner-in-crime since our 4th event ever (September 2012 when we showed Neil Meschino's MOLD). He often dresses in costumes inspired by the film we are screening. He spends his own money on prizes for our guests. His love for horror and excitement is contagious. Tim Gutschenritter: Slaughter began at Czar Bar. It was not the most professional setting for a screening, but we had a lot of fun there. We projected the films on a small screen and they also played through the TVs. It was held there for 2 years and that's thanks to my good friend and owner of Czar, Tim! Adam Roberts: We moved Slaughter to Screenland Armour when Czar had to shut their doors and our crowd has grown exponentially since our move. We couldn't be happier to be showing our films in a historic, locally owned theater. And this is all thanks to our fellow horror-loving friend, Adam Roberts, who just so happens to own Screenland Armour and Tapcade and allows us to continue to host Slaughter free of charge. I also want to thank Kaleigh Rangel and everyone who works at Screenland. Chelsea Opperman: Chelsea joined our team in the past few months and has been writing reviews of all the films we screen for our new blog. She is a really creative reviewer and is now giving us reason to reach horror fans worldwide. 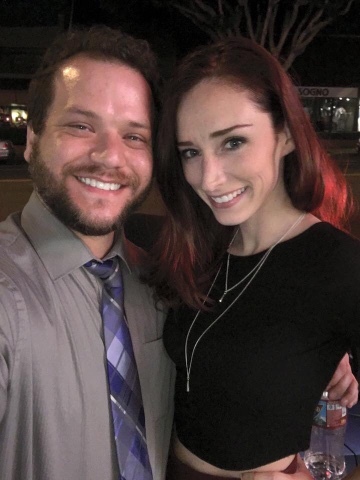 She also just recently started a podcast with Nicole Huval, Don't Tell Mom the Babysitter's Undead! Elijah LaFollette: Elijah began designing our posters in the last year or so. We love his work. He also is a huge VHS freak - he hosts a monthly event at Tapcade called Analog Sunday where he screens crazy obscure films on VHS. Check it out. The next one is this Sunday, June 5th. Erica Kauffman: Before Elijah, Mrs. Kauffman designed all of our posters. 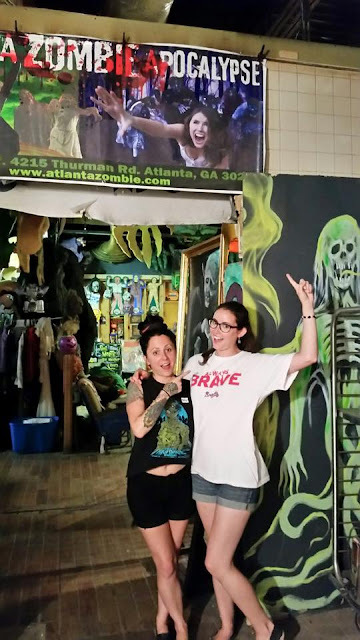 Erica is the artist behind the extremely successful horror t-shirt business Atomic Cotton. They are doing SO well and that is why we had to find other help in the art department. We are so proud of Atomic Cotton. Filmmakers: ALL OF YOU! We couldn't do this without the films. We get submissions, but a lot of it is me seeking films out and asking the directors if we can show them. You all, also, inspired me to try filmmaking myself. This thing started with James Bickert's DEAR GOD, NO!, Patrick Rea's NAILBITER, and Vito Trabucco's BLOODY BLOODY BIBLE CAMP - because of this I feel so close to you three and your films. Thank you for believing in this and being apart of it. John Pata: Not only did we have a special Saturday night Slaughter Movie House to screen John and Adam Bartlett's feature DEAD WEIGHT, but John has helped me program a lot of films. He has been a tremendous inspiration to me on all fronts. Have you seen DEAD WEIGHT? It was made pretty much by a pair of first-time directors and it delivers an emotional punch that very few people achieve- EVER. That's how I knew - 3 years later - that I could trust John with the very important role as editor on my film, THE STYLIST. I didn't have a worry in my heart. Our Attendees: Oh my god! We now are averaging 50-60 people at each event. It started as 10-15! You all are why this thing is still going. I can't believe it. Where are you all coming from?? Thank you. I'm sure I'm forgetting someone/something here. .... Please know I love you all and am so thankful. Please join us in celebrating 4 years of SLAUGHTER this Monday at Screenland Armour. 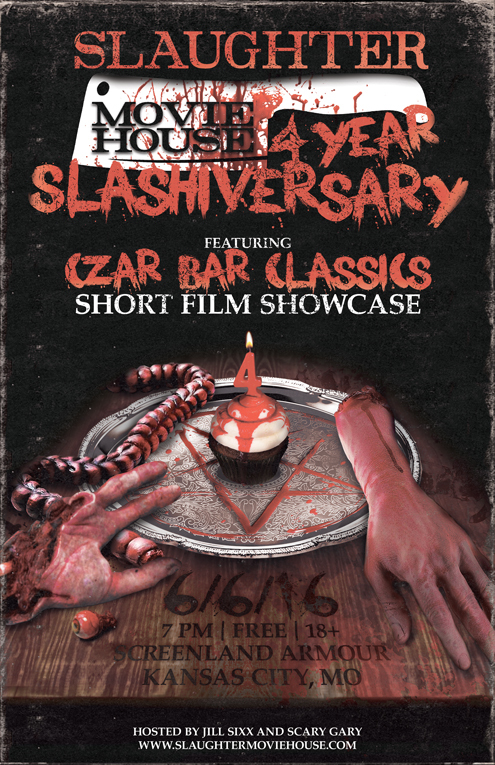 We are showing a collection of some of our favorite short films from the Czar Bar days. There will be cake! 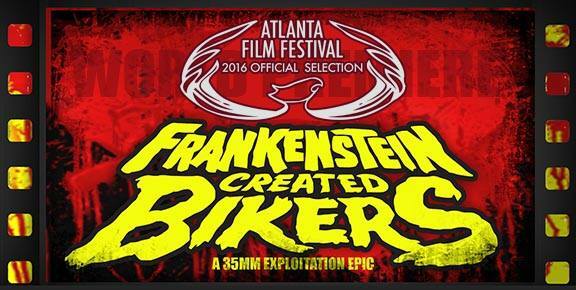 FRANKENSTEIN CREATED BIKERS: One Week Until World Premiere!! FRANKENSTEIN CREATED BIKERS is James Bickert's 35MM Epic sequel to DEAR GOD NO! Just a year ago we were raising funds on Kickstarter. And in one week and one day (Saturday, April 2 at 9:30 PM) it's making its world premiere at the 40th Annual Atlanta Film Festival! All of the stars will be there: Tristan Risk, Jett Bryant, Ellie Church, Laurence R. Harvey, Madeline Brumby, Gia Nova and more! Me too! I am so excited. Last year when I first heard about the Kickstarter campaign I contacted James and asked if I could help in someway. I wanted to work on the film. He offered me the position of assistant director and I jumped at the opportunity (with no experience). I met James (Jimmy to most) and his gang at Texas Frightmare Weekend 2012. My flight got in early on a Friday and it was hot as hell so I went to chill at the pool. I see a group of long-haired, tattooed, already appear to be drunk at noon looking people and think, I wanna hang with then. So I did and they tell me their film DEAR GOD NO! is showing at midnight. I didn't think these crazy drunks would make it to midnight, they showed me!! Such a wild and fun weekend. That is also where I met Laurence R. Harvey. When I got home I was so amped up from meeting so many inspiring people. I wanted to figure out a way to be part of that world. Making a film didn't dawn on me at first. Coincidentally some friends of mine who owned a bar here in Kansas City, Missouri were interested in hosting a regular movie night. That's where Slaughter Movie House began, a monthly independent horror screening series I still run today. DEAR GOD NO! was the first film we screened. It was the inspiration for Slaughter. And Slaughter is what made me believe I too could make a film. For this reason I feel extremely close to James and this gang who made Dear God NO! James and me on my last day on Frankenstein. 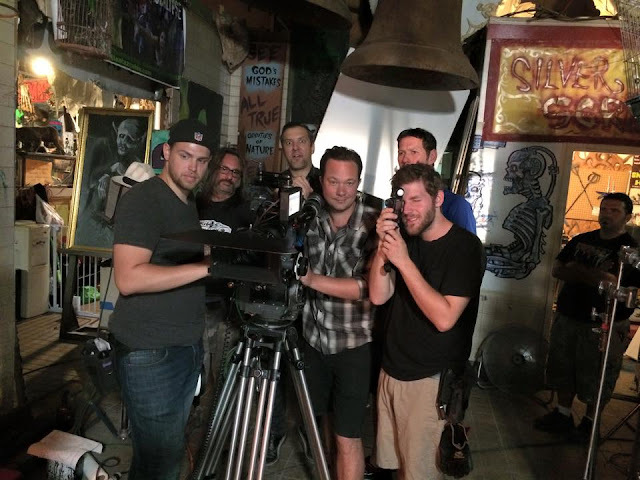 We shot FRANKENSTEIN CREATED BIKERS' principle photography last May. Our days were full of machine guns, strippers, stunts, blood, explosions- it was a one of kind experience. Each weekend we would head out to a different remote location- which was my favorite. I love the morning, driving, the outdoors and exploring. There were hard times of course, but worth every second. There are so many stories to tell, but most would spoil the film. Working on a shoot, especially this film, is like a new adventure everyday. I am addicted to that feeling. Tristan Risk, my arm, and Laurence Harvey. Jonathan Hilton, me, and a gorgeous camera! I felt like this was a once in a lifetime opportunity- to work on a exploitation film shot on 35MM. It was like my chance to hop in a time machine. Jonathan Hilton was the director of photography, he also shot DEAR GOD NO. I really freaking love this dude. He taught me a lot. Somedays I did the slate and I'm not sure anyone else liked me doing it (ha!) but I loved to learn about it. This is where I learned that with actual film, we need to record the amount of feet used on each take so that we are prepared to change rolls. You don't want to run out in the middle of a take. Duh, right? But I had never experienced it before. I did not go to film school. I am learning as I do and I geek out. We are so spoiled by digital cameras. It's truly a different thing. I see the romance in doing it this way. It takes so much more discipline. I've told Jonathan I want to work together someday. The red band trailer for FRANKENSTEIN CREATED BIKERS was released last month. Check it out HERE. It is an honor to be part of this team. I made so many great friends on this project. James and his wife + producer Lisa treated me like family during my time in Georgia last year. I can not wait to see the film with everyone next week in Atlanta. If you can join us a the premiere, grab your tickets now! Me, Ellie Church (actress), and Joey Meyerhoff (sound) in the country on Day 11. Me and Allison Maier (actress and PA). Me, Joey Meyerhoff, and Robert Alvarez (grip). 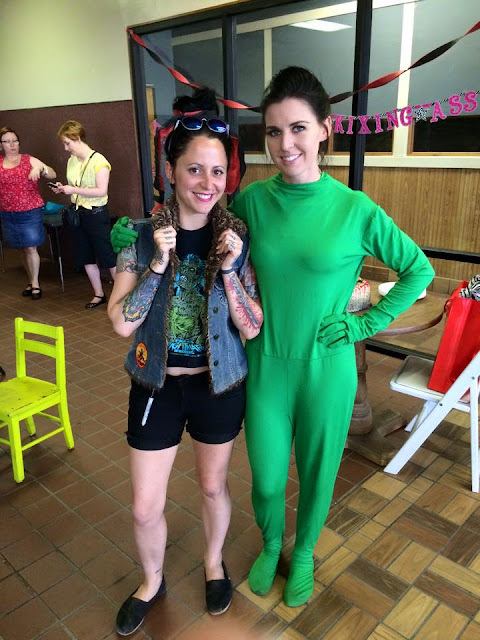 Me and Madeline Brumby (actress). Greetings! 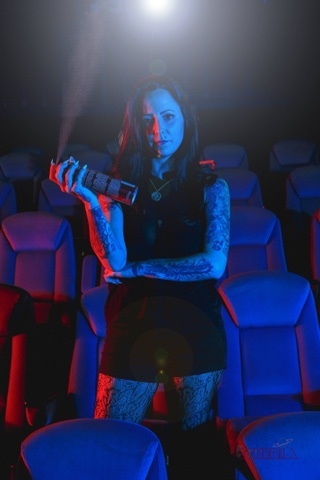 I am Jill Sixx Gevargizian: filmmaker, hairstylist, traveler, and horror fanatic. 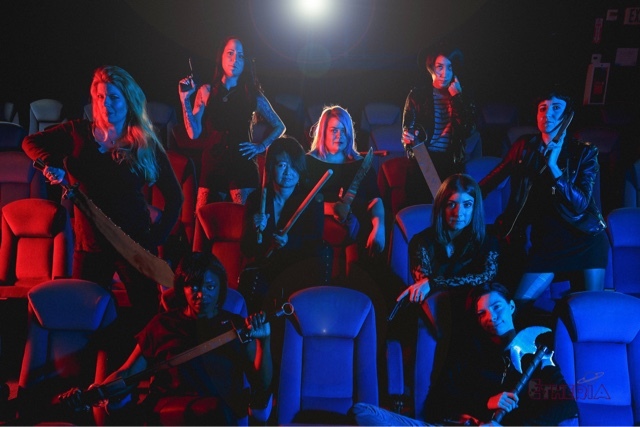 I run a screening series called Slaughter Movie House here in Kansas City, MO. The first Monday of every month we showcase independent horror films. We also host screenings of classics at a local theater. If you have a film you are interested in screening here, please contact me! Also- my directorial debut, CALL GiRL, is on the festival circuit now. Check it out!